There’s something to be said about a series that’s reliably good even after ten installments. Chicagoland Vampires may not be my favorite urban fantasy ever, but it’s certainly on my list of favorites. And as other series disappoint me and the list gets shorter, Chloe Neill can be counted on to deliver. That’s not to say that the series didn’t have its ups and downs. There was a low point a few books back that’s pretty much forgiven and forgotten. The last few books have been excellent and the next few will likely be fabulous as well. 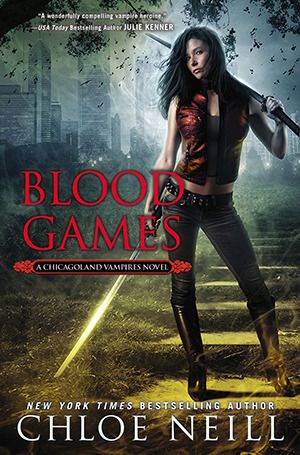 In Blood Games, Merit, Ethan and Jonah investigate the death of an ally. The son of a detective, a well-known friend of vampires no less, has been brutally murdered. The manner of his death blatantly points to vampires themselves, which can be taken as a warning to those who help them, or as a direct move against Merit’s kind. On top of that, Ethan is right in the middle of a major political battle, and the story arc about GP is finally brought to its boiling point. I have to say I was a bit surprised, but very happy with how it was resolved. The alternative had the potential to ruin the series, not to mention Ethan and Merit’s relationship. Ethan Sullivan, I’m afraid, is his usual stubborn self. No matter how many times he gets burned for being stubborn and difficult in his relationship with Merit, the man just never learns. Honestly, by now Merit should have thought of some sort of cruel and unusual punishment for this type of behavior, preferably something that includes Ethan on display with very little clothes on. Or you know, none. Through it all, though, Merit was consistently mature. She handled the situation with her usual calmness and grace. She, apparently, learned a lot, while Ethan remained frustratingly oblivious. The secondary characters remain just as strong. I’m surprised by how much I’ve warmed up to Jonah, considering my initial feelings about him. But I like discovering his character, finding out details that further convince me of his intelligence and integrity. Neill has had a lot of time to develop his personality, and she’s done an amazing job of it. I love these guys so much by now and I can’t wait to continue their adventure. I've fallen terribly behind on this series! I'm still needing to get around to reading 8 but I have every intention of doing so. This is such a fabulous series and I'm glad to hear that it's still going strong! I couldn't agree with you more on this series Maja! I am behind but I am so glad to see that it is still going strong. Ethan = the epitome of "can't teach an old dog new tricks", though Merit is slowly wearing him down. She certainly has a lot more patience with him than I would. And I agree -- maybe not my fave series but always good and consistent in its enjoyability (with the exception of one minor dip a few books back). We're review twinsies today! This series was touch-and-go for a bit, but I agree, the last few books have been excellent, and the next look promising as well. I was a little annoyed with Ethan in this installment, but otherwise I enjoyed it overall. Lovely review! I've given up on almost every series so it's great to hear there are still a few out there that manage to hold up after so many books. I've read the first few books in this series and I really enjoyed them. I need to get back to this series, especially since I adore Merit. I'm glad to hear that this is still going strong for you, Maja. Ethan sounds like he needs to be shaken a little, but I'm glad that Merit is still mature. It's nice to see that after so many books it's still good. I haven't tried any books in the series but I have the 3 first ones in French. I should try... soon! I'm so so happy to hear that you loved this one! I'm super super excited to finally get to read this one! Gosh I have got to get back to this series. I kind of shelved it after all the drama around books for and five. Glad this is still going strong. I intend to get back to it soon. That's awesome you've enjoyed most of the books in this series. I haven't read anything by the author, but I am curious too. After I finish the Kate Daniel's series (I just bought the audio of book one) than this is on my list. I am glad at ten installments it still keeps you going back for more. I haven't started this series since it has vampires, which I'm not a fan of, and it's just so looong. Unless an UF series is about to become an all-time favorite I'm skeptical of giving them a go but sometimes I just crave UF and try a new series--I'll have to remember this one next time instead of sampling series that never work out. If this is reliable for you, Maja, I know I can count on it. I just got caught up on this series when the last book came out, so I'm looking forward to this one too . . . despite Ethan's continual pigheadedness . . . He has to learn eventually, right? Great review, Maja! I have to admit, I've read many recommendations for this series, but I was skeptical of the sheer number of installments it has! But if it's still working for you at Book #10, I should probably give it a shot. I've been trying very hard to map out a half hour of "fun" reading time before bed every night, and I hope to continue that in a few weeks when I start my PhD program, so maybe this series will become one of my bedtime books! Thanks for the review! Hope everything is well with you!